Ellie Barton and Phil Hendicott decided to spend their wedding in their birthday suits. The pair of exhibitionist Aussies exchanged vows in front of 250 guests wearing nothing more than their wedding rings – and a bouquet of strategically-placed roses. Mrs. Ellie Hendicott wore a white, painted on “dress.” The only thing she really wore besides the bouquet was a long white wedding veil. Phil Hendicott wore nothing but a black top hat to cover his manhood. The wedding ceremony was conducted in the morning, live on FM radio to hundreds of thousands of Australians. But the ultimate thrill-seekers’ wedding doesn’t have to end there – once the wedding party have all been lowered back to earth, guests can head skywards again – for a floating reception. Wedding guests are wowed with a three-course wedding breakfast – all while strapped in to the dining chairs. The cost for such a spectacular ceremony? Around £25,000. The bride from Guangzhou, China, set the world’s longest bridal train record at 219 yards. 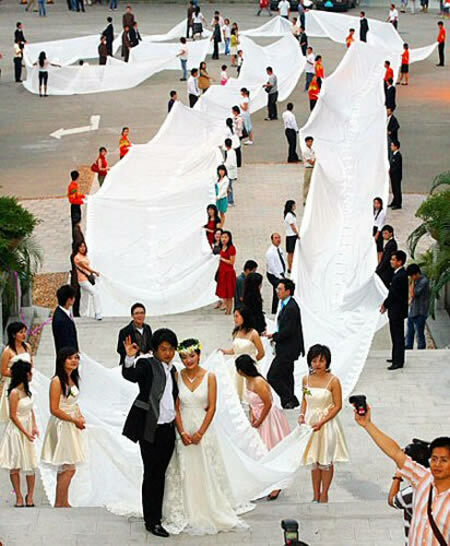 The Chinese bride accented her gown with a train that was over 600 ft long and weighed over 220 lbs. Xie Qiyun had this photos taken in front of a hotel in Guangzhou, the capital of Guangdong Province on her special day. According to Guinness, the longest wedding dress train measured 1362 m [4468 ft 5.94 in] and was created by Andreas Evstratiou in Paphos, Cyprus, in February 2007.
Who doesn’t get excited about the prospect of bagging a bargain? Bride Lisa Satayut decided to combine that feeling with her excitement over bagging her beau. 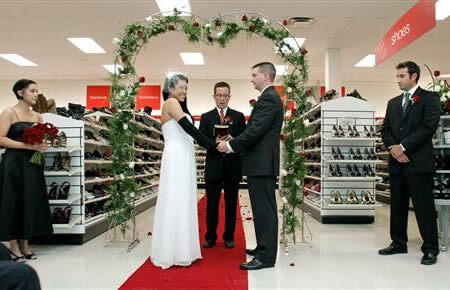 Explaining that T.J. Maxx is her “happy place,” Satayut married Drew Ellis in the size 8 shoe aisle of a T.J. Maxx store in Mt. Pleasant, Mich. The bride — a self-proclaimed “’Maxxinista” — wore a strapless white chiffon gown, with long black gloves and bright green gladiator-style sandals. A widened aisle, vine-covered arch and white chairs with red bows highlighted the traditional ceremony that included string music, display-dodging cameramen — and curious shoppers who stopped bargain hunting long enough to watch. Groom Xiao Wang spent a year’s salary on buying 99,999 red roses for his bride, Xiao Liu, for their wedding conducted in Chongqing, central China, where the number 999 is considered to be a good luck omen. 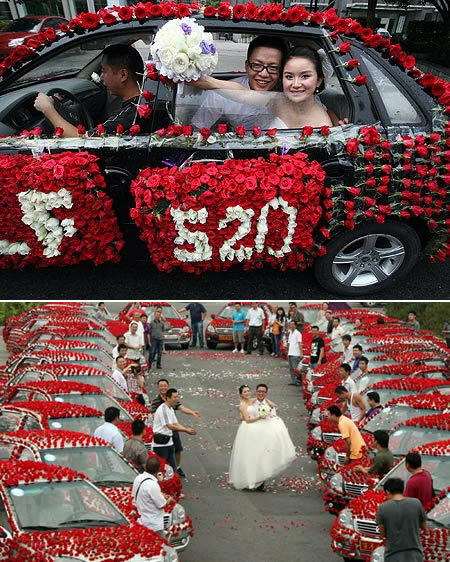 The couple, both 24 years old, needed 30 cars to take the flowers to the service. They advertised on the internet for car owners and for helpers to stick the flowers on the vehicles. The flowers themselves were flown in from the other side of the country. ‘I remembered that Liu loved these special roses and the idea just grew and grew. 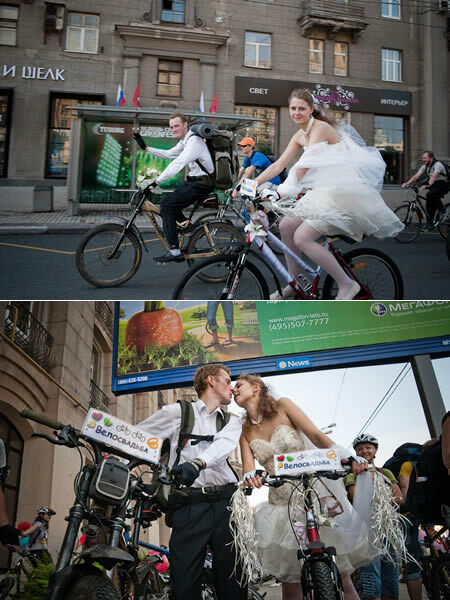 It was worth it all just to see the look on her face when she saw the cars,’ said groom Wang. Liu who met Wang while they were at University together added, ‘I mentioned a year ago I would like a romantic wedding; I can’t believe he remembered, but it was amazing.’ The groom also donated 20% of the cost of the roses to charity to get even more good luck. A heartbroken mother decided to “marry” her murdered fiancé in a hospital morgue. Irish father-of-two Kevin Lavelle, 29, was viciously battered with an iron bar in a gruesome gang attack while working away from home to raise money for his wedding to fiancée Michelle Thomas. The caring dad was attacked by nine louts and beaten to death as he returned to his lodgings in Banbury, Oxfordshire. But even death could not keep him and Michelle apart. Despite her unbearable pain, Michelle organised a “wedding” in the morgue of Oxford’s John Radcliffe Hospital, where Kevin lay dead. The touching ceremony – witnessed by close family and friends – was conducted by the hospital’s Catholic priest who administered the last rites to Kevin. In front of an open coffin, the priest blessed the wedding rings that Michelle had bought specially for the service. Their two children, James, now five, and Megan, now four, went to their daddy’s funeral wearing the clothes they would have worn to their parents’ wedding. 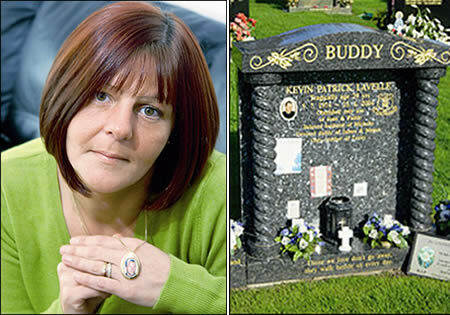 The priest asked Michelle if she would have taken Kevin to be her “lawful wedded husband” and she replied “I do.” Kevin’s dad Paddy placed a ring on Michelle’s finger and a ring was placed on Kevin’s finger as he lay in the coffin. Did you know that there’s a Guinness World Record for the most bridesmaids in a wedding? One bride from Proctorville, Ohio, broke the record with more than 100 bridesmaids at her June 11, 2010 wedding. Jill Stapleton, who owns Jill’s Tumble World, a dance school, asked her students — all 110 of them — to be her bridesmaids and walk down the aisle at her wedding. The bride asked each girl to choose her own dress for the wedding in either purple or teal, the school’s colors. In lieu of bridesmaid bouquets, each bridesmaid carried a single rose. The previous record for the most bridesmaids in a wedding was 90. Previous article Has An ‘Alien Humanoid’ Just Been Found In India?